Near Esparto, in the beautiful Capay Valley region of central California, 1,400 young almond trees flourish in a century-old orchard overlooking the hills. Since November, they've stood in perfect rows without a hint of foliage — resting, naked and dormant, for the upcoming growing season. Their branches now swell with bright pastel blooms in preparation for pollination. Like most almond growers, Brian Paddock, owner of Capay Hills Orchard, relies on bees to provide this important aspect of crop development. "No bees, no almonds. It's that simple," he says. Often considered pests, frightful little creatures with a nasty sting, bees play a critical role in agriculture and the pollination of countless crops. Without them, many varieties of fruits and vegetables would come to an end. It's an agricultural doomsday scenario that has Paddock worried. Bee deaths have been on the rise, with losses outpacing colonies' ability to regenerate. Last year, the U.S. lost 44 percent of all honeybee colonies — a species essential to commercial pollination in this country. Other species of bees have neared mass extinction, including the rusty patch bumble bee and seven species of Hawaiian yellow-faced bees. A world without bees may seem far-fetched, but experts are looking for ways to help plants survive without them. Eijiro Miyako, a researcher at Japan's National Institute of Advanced Industrial Science and Technology, has designed what he believes could one day be a partial solution: an insect-sized drone capable of artificial pollination. 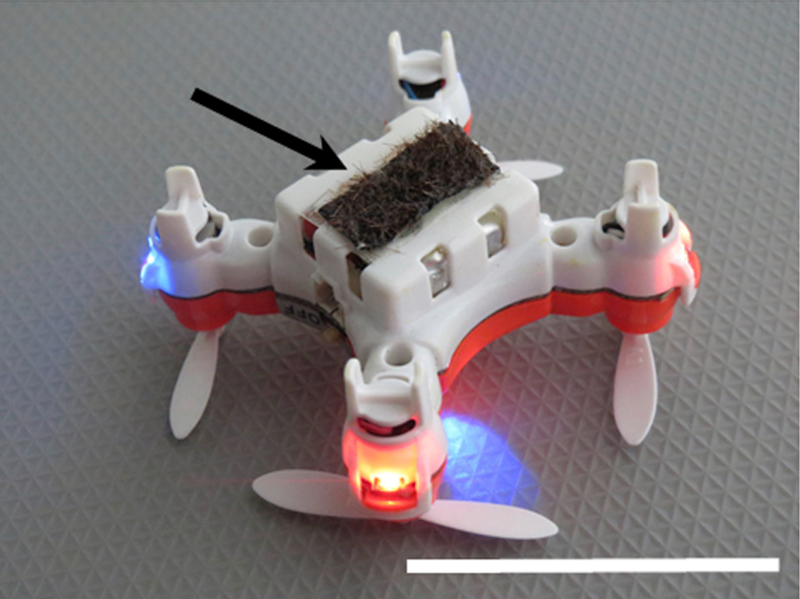 Coated with a patch of horse hair bristles and an ionic liquid gel, these pint-sized robots can collect and transfer pollen from one plant to another. The project stems from a serendipitous moment. Miyako had previously experimented with using the specialized gel for electrochemical applications. When the gel performed poorly, he tucked the bottles away in a drawer and forgot about them — until he moved out of his lab two years ago. As soon as he rediscovered the gel, he thought about the pollination crisis and honeybee decline. Conventional gels, Miyako explains, are mainly made of water and lose their stickiness over time. But his ionic liquid gel, by contrast, is a substance with a long-lasting "lift-and-stick-again" adhesive quality – ideal for moving pollen from one plant to the next. "The continued adhesiveness and non-volatility of the ionic liquid gel was exciting," says Miyako. The team first tested the biocompatibility and eco-friendliness of the gel against ants (which are also pollinators) and cells from mice, and found that it had no harmful effects after three days. And when a drop landed on the floor and attached to an ordinary piece of dust, he was sold. Miyako performed additional tests on living samples. In one experiment, he placed ants in a box of tulips. One subset of the insects had the gel applied to their backs, while the others remained untouched. Those with the sticky residue collected pollen from the flowers. Although artificial pollination is already possible, it's a tedious, time-consuming process. When done by hand, using a brush to apply the pollen, a person can pollinate five to 10 trees a day, depending on the size of the trees. Tackling thousands of trees takes major manpower and a hefty budget. "There are 1 million acres of almond trees in California," says Marla Spivak, a MacArthur Fellow and entomologist at the University of Minnesota. "Every flower needs to be pollinated to set the nut. Two million colonies of bees are trucked in to pollinate the almonds, and each colony has between ten and twenty thousand foragers. How many robots would be needed?" She notes there are 20,000 species of bees in the world, each with unique flight patterns and body sizes to get into different flowers. Bumble bees, for example, are far better pollinators for tomatoes, while leafcutter bees are aces at alfalfa. The diversity of bees and flight patterns leads to more efficient and effective pollination. Although Spivak is skeptical about using drones for fertilization, she believes robots could be beneficial in delivering pesticides — which can harm bee health — in a very precise way to reduce drift and overuse. Miyako's current robo-bee prototype is still very much a work in progress, far from a real-world field test. For one thing, it's not autonomous. The drones must be remote-controlled, by humans, and can be difficult to maneuver. "It was hard to control the robotic pollinators so that they would precisely hit the target sites," says Miyako. He's looking into incorporating artificial intelligence, GPS, and a high-resolution camera in future prototypes. Quinn McFrederick, an entomologist at the University of California, Riverside, sees some potential for eventually using drones to pollinate commercial crops, especially if programmed with artificial intelligence. But he, like many experts, says it makes much more sense to protect our natural pollinators than to develop new technology. "On top of more practical arguments, such as costs to smaller farms," he says, "I would not like to live in a world where bees are replaced by plastic machines. Let's focus on protecting the biodiversity we still have left." Miyako acknowledges the skepticism about his project, but notes that he sees his drones not as a replacement for bees, but as a potential future ally in the face of extinction. Crystal Ponti is a science, technology and health reporter based in Augusta, Maine.